But then I pictured a bunch of people in boats and (gasp!) throwing their ‘ukuleles overboard and trying to literally use them an an anchor. The image made me laugh. And I was equally horrified by the thought. But it’s what I’ve been trying to do lately: use the ʻukulele as an anchor. 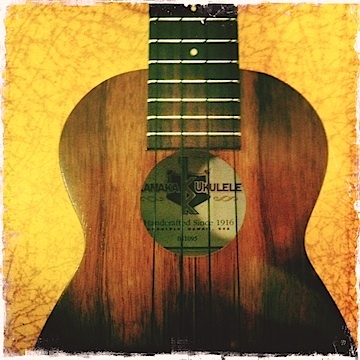 Or more specifically: Using the SOUND of the ʻukulele as an anchor to the present moment. It’s not that uncommon. We all do it–at least to a certain extent. When the going gets rough, we “check out” (mentally) and go to a happy place. Perhaps a happier time in the past. Or even dream of a happy time to come in the future. And let me be clear: I’m so thankful to have been able to do that as a kid. I’m pretty sure it saved my life. However, if that becomes a standard practice/habit for you, you run the risk of losing touch with the present. Think about how much time you spend during the day thinking about “What if…” (future) or “I should have…” (past). It’s pretty wild how little time many of us stay rooted in the PRESENT moment. That’s a HUGE problem for me. The sound, in essence, wakes them from their dream state. It helps them to become aware of the NOW. It serves like an anchor–something to hold on to. And I was thinking that I could do the same thing with my ‘ukulele. For example, I spend a significant part of my day studying about the ancient traditions of an ancient valley. Then I spend time studying “vintage” songs–the crooner classics–that I love so much. And I also spend a piece of my day working on a writing project that explores events from my personal past. That’s a lot of living in the PAST. One thing that I keep close at hand is my ʻukulele. You guys know how much I value a simple strum break. The sound of those 4 simple strings helps to ground me. It’s like my “bell.” My anchor to the present. This week, I’ve been taking a moment to really LISTEN to the ʻukulele. And I really LISTEN to it. This isn’t about listening to see if my ‘ukulele is tune. Or even to strum the opening of a tune I’m about to play. This is just to listen to the sound. And I’ve gotta tell you: it’s helping. It’s really neat to be able to strum and take a deep breath and just listen. So, I thought I’d pass this little practice along to you. Maybe it will help you, too! Using the ʻukulele as an anchor to the present moment. What tools/tricks/techniques help YOU stay anchored to the present moment? Drop me a line! I’d love to hear from you.